Selective estrogen receptor modulators (SERMs) have been developed in order to create means to control estrogenic effects on different tissues. A major drawback in treatment of estrogen receptor (ER) positive breast cancer with the antagonist tamoxifen (TAM) is its agonistic effect in the endometrium. Raloxifene (RAL) is the next generation of SERMs where the agonistic effect on the endometrium has been reduced. The aim of the present study was to determine the effect of SERM treatment on the uterus, as assessed by proliferation markers and several factors involved in uterine growth. Ovariectomized (ovx) rats were treated with estradiol (E2), tamoxifen (TAM), RAL, ICI182780 (ICI) or vehicle (OVX-controls). We studied the effects on mRNA levels of the growth hormone (GH) receptor, insulin-like growth factor-I (IGF-I), ERα and ERβ. In addition, by immunohistochemistry the proliferation markers PCNA and Ki-67, as well as ERα and ERβ, were detected. The uterine weight of the rats treated with E2 or TAM was increased as compared to OVX-controls. The uterine GH-receptor mRNA level was highest in the E2 treated animals. In ICI treated rats no GH-receptor mRNA could be detected. The IGF-I mRNA level increased 16-fold in uteri of the TAM treated group and 9-fold in the E2 treated rats as compared to OVX-controls. The ERα mRNA level was increased in the E2 treated rats, while the ERβ mRNA level was increased after TAM treatment. The proliferation, as assessed by PCNA, was lowest in ICI treated animals. The uterine wet weight, the LE height and the GH-receptor mRNA levels showed similar patterns, indicating that GH is involved in the regulation of uterine weight. Tamoxifen, which has been related to increased incidence of endometrial carcinoma in women, dramatically increased IGF-I mRNA levels in rat uterus. Since proliferation was not higher in TAM and E2 treated rats than in OVX controls, this assay of simple, early proliferation does not give the full explanation of why TAM should enhance the risk of developing endometrial cancer. In recent years substances being either estrogenic or anti-estrogenic depending on the tissue where the action is exercised, the so-called selective estrogen receptor modulators (SERMs), have been developed further [for reviews see [1–3]]. Tamoxifen (estrogen antagonist in breast, agonist in uterus) is the most commonly used substance for treatment of women with ER positive breast cancers and well known to decrease the risk of breast cancer when given prophylactically . However, the risk of developing endometrial cancer is increased 3-fold in TAM treated women . Raloxifene is a representative of the next generation of SERMs where the agonistic effect on the endometrium has been reduced . ICI182780 is a pure estrogen receptor antagonist , for both ERα and ERβ . This substance is now also known as fulvestrant (Faslodex, Astra-Zeneca) , and has recently been approved by FDA in the USA for treatment of hormone-receptor-positive metastatic breast cancer in post-menopausal women with the disease progressing following anti-estrogen therapy. In the uterus the proliferative effects of estrogens are mediated, at least partly, by growth factors, e.g. IGF-I and epidermal growth factor (EGF) [8–10]. Estrogen treatment has been shown to increase IGF-I mRNA levels in rodent uteri [8, 9, 11]. Treatment of ovariectomized rats with IGF-I resulted in an increased uterine weight as compared to controls . Studies in IGF-I knockout mice have shown that it is not only the locally produced IGF-I that affects uterine development and epithelial proliferation, the systemic levels of IGF-I are more important than previously thought . Tamoxifen acts as an estrogen agonist in inducing endometrial expression of IGF-I . GH receptor/GH binding protein immunoreactivity has been found both in endometrium and myometrium of rats . In GH receptor/GH binding protein knock-out mice the GH resistance leads to reduction of peripheral IGF-I levels. This is associated with delayed puberty of the females, alterations in fetal and placental growth, delay of parturition and a reduced litter size . The aim of the present study was to compare effects on growth promoting factors in the rat uterus after treatment with estrogen agonists, partial agonists or antagonists. Treatment with E2, TAM, RAL and ICI are compared. Estrogen treatment stimulates uterine proliferation and thereby increases uterine weight. Several SERMs have been developed in order to avoid proliferative effects in the uterus, e.g. RAL. In this study we examined the effects of these compounds on the mRNA levels of the GH receptor/GH binding protein, IGF-I, ERα and ERβ in the uteri of OVX rats. In addition ERα and ERβ were visualized using immunohistochemistry. The effects on the proliferation markers PCNA (proliferating cell nuclear antigen) and Ki-67, as assessed by immunohistochemistry, were also studied. Ovariectomized animals treated with vehicle alone served as controls. Twenty-seven adult female Sprague-Dawley rats, 55–60 days old and weighing approximately 250 g, were used. The animals were housed in a controlled environment at 20°C on an illumination schedule of 12 h of light and 12 h of darkness each day. Standard pellet food and water were provided ad libitum. The rats were anesthetized with Hypnorm® (fentanyl citrate 0.315 mg/ml + fluanisone 10 mg/ml) (Janssen-Cilag Ltd, Saunderton, UK) and midazolam (Alpharma, Oslo, Norway), ovariectomized and housed for 14 days before initiation of hormone treatment. They were treated 48 hrs with either 2.5 μg 17β-estradiol (E2) /rat (n = 8) and day, 500 μg tamoxifen (TAM)/rat (n = 5) and day (both substances purchased from Sigma, St Louis, MO, USA), 500 μg raloxifene (RAL)/rat (n = 5) and day (gift from Eli Lilly and Company, Indianapolis, IN, USA) or 500 μg ICI182780 (ICI)/rat (n = 5) and day (gift from Dr. A.E. Wakeling). The control group (OVX) (n = 4) received vehicle only (propylene glycol). The animals received injections in the morning of day 1 and 2, and were sacrificed in the morning of day 3. The Committee on Animal Care in Sweden approved the animal studies. During anesthesia, the uterus was removed, stripped of fat and connective tissue. The uteri were weighed, divided, one half immediately frozen in liquid nitrogen and stored at -70°C until analyzed. The other half was immersion-fixed in 4% formaldehyde at 4°C for 12 hours, stored at 4°C in 70% ethanol and thereafter embedded in paraffin. Total nucleic acids (TNA) were prepared as described before . In short, the tissues were homogenized and digested with proteinase K in a SDS-containing buffer, followed by subsequent extraction with phenol-chloroform as described in . The concentration of total DNA in the TNA samples was measured fluorometrically at the wavelength 458 nm with Hoechst Dye 33258 . The solution hybridization analysis of specific mRNA was performed as previously described [18, 19]. For measurement of mRNA, RNA probes were synthesized in vitro and radiolabeled with 35S-UTP (Amersham, Bucks, UK). The in vitro synthesis of radioactive cRNA was performed essentially as described by Melton et al. using reagents supplied by Promega Biotech, Madison, Wisconsin. 35S-UTP cRNA was hybridized (20000 cpm/incubation) at 70°C to TNA samples as previously described . Incubations were performed in micro-centrifuge vials (Treff AG, Switzerland) in a volume of 40 μl containing 0.6 mol/l NaCl, 20 mmol/l Tris-HCl, pH 7.5, 4 mmol/l EDTA, 0.1% SDS, 0.75 mmol/l dithiothreitol and 25% formamide. After overnight incubation, samples were treated with RNase for 45 minutes at 37°C by adding 1 ml of a solution containing 40 μg RNase A and 118 units RNase T1 (Boeringer-Mannheim, Mannheim, Germany) and 100 μg calf thymus DNA to each sample. Radioactivity protected from RNase digestion was precipitated by the addition of 100 μl 6 mol/l trichloroacetic acid and collected on a filter (Whatman GF/C). The radioactivity on the filters was compared with a standard curve of known amounts of in vitro synthesized mRNA complementary to the probe used. Results are expressed as amol (10-18) mRNA/μg DNA in the TNA sample. The probe used for IGF-I mRNA determinations was derived from a genomic clone of mouse IGF-I , a 160 bp Ban I-Pvu I fragment from exon 3 (assuming homology to human IGF-I) was subcloned into the RNA expression vector pSP64. The GH-receptor probe was derived from a 0.6 kb rat GH-receptor cDNA from lambda clone 1 . The probe is directed against the extracellular part of the receptor and therefore detects also the GH-binding protein in rodents. Thus, when stated in the following text that the GH receptor mRNA was measured, it means in fact a combination of the mRNAs for the GH receptor and the GH binding protein was assessed. The probe used for ERα mRNA determinations was derived from pMOR101. An Eco RI fragment of 1.9 kb containing the whole open reading frame of the mouse estrogen receptor α  was inserted into a pSP64 vector. Restriction of this plasmid with Bgl II allows the synthesis of a probe corresponding to nucleotides 1470–2062, which encode the C-terminal, half of the steroid binding domain (E) and all of domain F. The 300 bp probe used for ERβ mRNA determinations corresponds to an XbaI-EcoRI fragment of the 3' untranslated region, derived from an ERβ clone from rat prostate (plasmid 37 of clone 29, see ref ). It was subcloned into a Bluescript KS plasmid. After linearization with XbaI, T3 RNA polymerase was used to transcribe the antisense probe. The sense probe was transcribed from a template linearized with Eco RI using T7 polymerase. Thus, both ERα mRNA and IGF-I mRNA were detected in the rat tissues using heterologous mouse probes. Rat IGF-I and mouse IGF-I show a high degree of homology. It is feasible to use the mouse IGF-I probe to specifically detect rat IGF-I mRNA as demonstrated by Möller et al. 1991 . The rat ERα mRNA and mouse ERα mRNA show 97 % homology  and it has previously been shown that specific binding is obtained when the mouse ERα probe is hybridized to rat liver RNA on a Northern blot . Paraffin sections (5 μm) from the uteri were used. 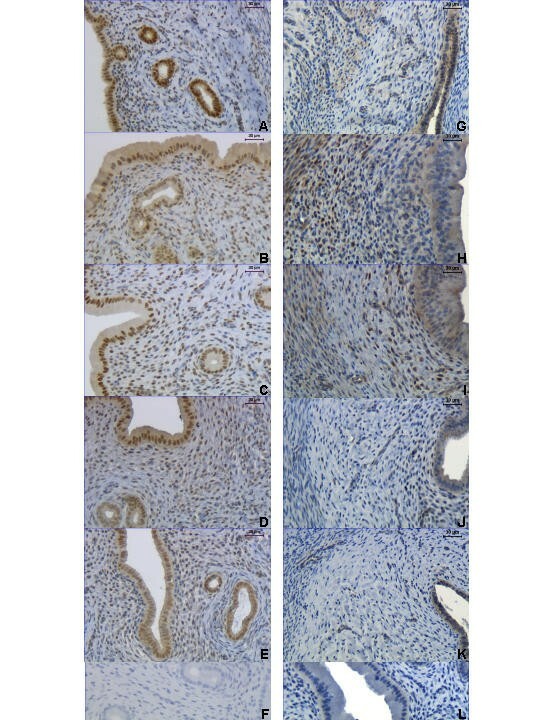 A standard immunohistochemical technique (avidin-biotin-peroxidase) was used to visualize PCNA and Ki-67 immunostaining intensity and distribution. A mouse anti-PCNA antibody (18–0110; Zymed Laboratories, Inc., San Francisco, CA) that reacts with PCNA from all vertebrate species was used in a 1:150 dilution. A monoclonal mouse anti-human Ki-67 antibody (NCL-Ki67-MM1; Novacastra Laboratories Ltd, Newcastle upon Tyne, UK), which cross-reacts with rat and mouse Ki-67 nuclear antigen was diluted 1:200 and used in the present study. A monoclonal mouse anti-human antibody was used for detection of ERα (ZM08-1149, Zymed Laboratories, Inc., San Francisco, CA). It recognizes the N-terminal domain (A/B region) of the ERα, and was diluted 1:15. A polyclonal rabbit anti-rat ERβ antibody (PA1-310B, Affinity Bioreagents, Inc., UK), which corresponds to the C-terminal amino acid residues 467–485, was used for detection of the ERβ. It was diluted 1:1000. The immunohistochemistry procedure has been described in detail in Wang et al. 1999 . Quantification of PCNA immunostaining was performed on the digitized images of systematic randomly selected fields of endometrial stroma, from which non-stromal elements (e.g. luminal and glandular epithelium) were interactively removed, and analyzed separately. A Leica microscope connected to a computer using Colorvision software (Leica Imaging System Ltd. Cambridge, England) was used for the image analysis. All luminal and glandular epithelia as well as 10 fields of stromal cells were measured separately in each tissue section. By using color discrimination software, the total area of positively stained cells (brown reaction product) was measured, and expressed as a ratio of the total area of cell nuclei (brown reaction product + blue haematoxylin). The calculation was made by one way ANOVA on ranks (Kruskal-Wallis test), and significance evaluated by Dunn's test ("all compared to all" or "all compared to control"). Values with different letter designations are significantly different (p < 0.05). Values with * are significantly different (p < 0.05) to OVX control. The uterine weight of the rats that were treated with E2 or TAM was increased as compared to the OVX control group (Fig. 1). The uteri of rats that received RAL or ICI did not differ in weight compared with OVX controls (Fig. 1). The effect of estrogen treatment can be assessed from the height of the luminal and glandular epithelia (LE and GE, respectively). The results from measuring the LE height in the slides stained for PCNA is shown (Fig. 1, second row). The LE height is higher in the E2 and TAM groups as compared to the OVX group (Fig. 1). The E2 treated group is also different to the ICI treated rats (Fig. 1). The GH-receptor mRNA level was increased in the uteri of the animals that were treated with E2 as compared to the ICI group (Fig. 1). In the ICI treated animals no GH-receptor mRNA could be detected (Fig. 1). The IGF-I mRNA level increased 16-fold in the uteri of the TAM treated group as compared to OVX controls. The level was higher than in both ICI treated rats and OVX controls (Fig. 1). 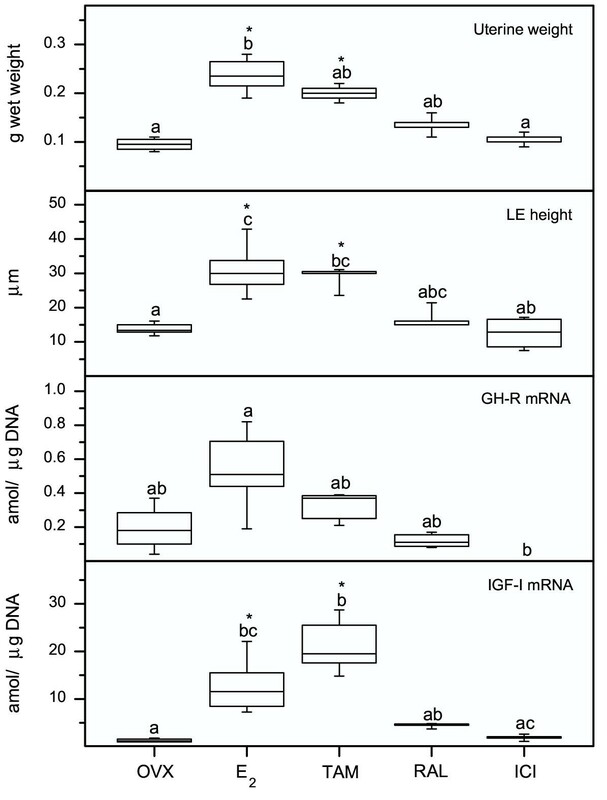 The rats that received E2 also had an increased level of IGF-I mRNA (9-fold) as compared to the OVX controls (Fig. 1). The uterine wet weight (g), luminal epithelium (LE) height (μm), growth hormone receptor (GH-R) mRNA (amol/μg DNA), and insulin-like growth factor-I (IGF-I) mRNA (amol/μg DNA), in the ovariectomized (OVX) controls and in the rats treated with estradiol (E2), tamoxifen (TAM), raloxifene (RAL) or ICI182780 (ICI). Box and whisker plots representing the median value with 50% of all data falling within the box. The whiskers extend to the 5th and 95th percentiles. Boxes with different letter designations are significantly different (p < 0.05), and the boxes with an * are significantly different to the OVX control group. The ERα mRNA level was increased in the E2 treated rats compared with OVX controls (Fig. 2). Tamoxifen treatment induced an increased ERβ mRNA level compared with OVX controls (Fig. 2). The ratio of the mRNA levels of ERα/ERβ was increased in the E2 treated group as compared to TAM and ICI treated rats (Fig. 2). The estrogen receptor α (ERα) mRNA (amol/μg DNA), estrogen receptor β (ERβ) mRNA (amol/μg DNA), and the ratio of ERα mRNA and ERβ mRNA, in the ovariectomized (OVX) controls and in the rats treated with estradiol (E2), tamoxifen (TAM), raloxifene (RAL) or ICI182780 (ICI). Box and whisker plots representing the median value with 50% of all data falling within the box. The whiskers extend to the 5th and 95th percentiles. Boxes with different letter designations are significantly different (p < 0.05) and the boxes with an * are significantly different to the OVX control group. The distribution of PCNA (A-E) and Ki-67 (G-K) in representative slides from the different treatment groups is shown in Fig. 3. Negative controls where the primary antibody was replaced by IgG were negative for both PCNA (Fig. 3F) and Ki-67 (Fig. 3L). 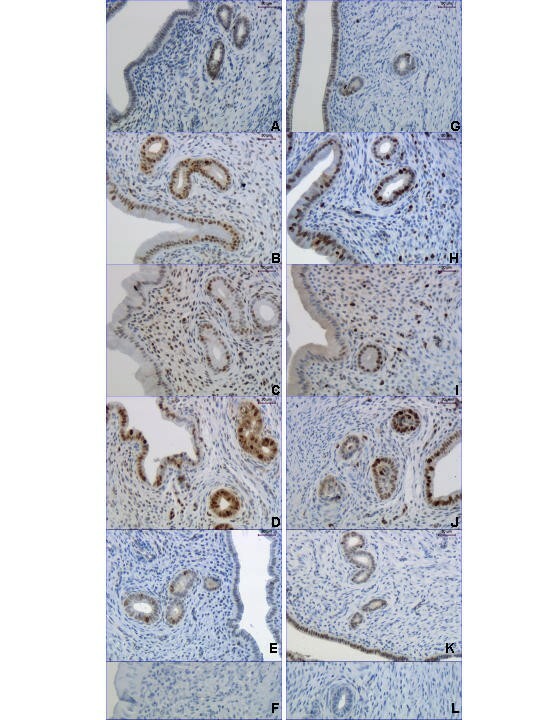 Immunohistochemistry results for PCNA (A-F) and Ki-67 (G-L). The image of OVX controls (A, G), E2 (B, H), TAM (C, I), RAL (D, J) and ICI (E, K) treated rats are shown. Negative controls where the primary antibody was replaced by IgG are shown for PCNA (F) and Ki-67 (L). The bars represent 30 μm, all images are in magnification ×200. PCNA is significantly less expressed in the ICI group, as compared to the E2, TAM and RAL groups in the stroma and as compared to the E2 and RAL groups in the GE and LE (Fig. 4). Image analysis results of the PCNA immunohistochemistry in stroma, glandular epithelium (GE) and luminal epithelium (LE). Box and whisker plots representing the median value with 50% of all data falling within the box. The whiskers extend to the 5th and 95th percentiles. In the control group (OVX) and ICI treated group n = 4, in the other groups n = 5. Values with different letter designations are significantly different (p < 0.05). The distribution of ERα (A-E) and ERβ (G-K) in representative slides from the different treatment groups is shown in Fig. 5. ERα immunostaining is found in the nuclei of GE and LE, as well as stroma of the uterus (Fig. 5A,5B,5C,5D,5E). The highest intensity of nuclear staining was observed in the OVX group (Fig. 5A). ERβ immunostaining was found in the nuclei of stroma, LE and GE, with the highest intensity in the stroma of the E2 and TAM groups (Fig. 5G,5H,5I,5J,5K). 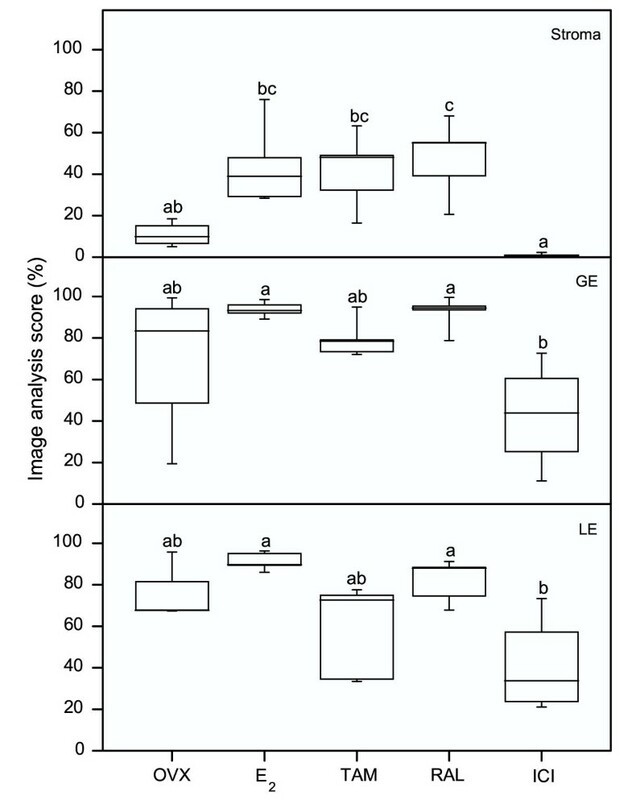 Negative controls where the primary antibody was replaced by IgG were negative for both ERα (Fig. 5F) and ERβ (Fig. 5L). Immunohistochemistry results for ERα (A-F) and ERβ (G-L). The image of OVX controls (A, G), E2 (B, H), TAM (C, I), RAL (D, J) and ICI (E, K) treated rats are shown. Negative controls where the primary antibody was replaced by IgG are shown for PCNA (F) and Ki-67 (L). The bars represent 30 μm, all images are in magnification ×200. The increase in wet weight of the uteri in the treated animals in this study was as could be expected; i.e. the weights were in order E2 > or = TAM > or = RAL = ICI = controls. The uterine GH receptor mRNA level showed a similar pattern as the weight, although for the GH receptor mRNA there is no significant difference between the OVX controls and the E2 group (and the E2 and TAM groups if comparing only to controls). However, the animals treated with the pure antiestrogen ICI had levels of GH receptor mRNA below detection limit. This implies that the GH receptor expression could be exclusively regulated via the estrogen receptors. The few studies on the GH-receptor expression in the uterus found in the literature are contradictory. In one study GH receptor mRNA was found in the mouse uterus, and the stromal expression decreased after progesterone treatment but E2 had no regulatory effect . In our experiment the effects of progesterone were not studied. A reason why E2 was found to regulate GH receptor mRNA in the present study, as opposed to the study in mice, can be that we studied effects after a short period of treatment (48 hrs) while the mice were treated for 8–11 days. It is possible that the E2 induced increase in GH receptor mRNA is transient, or E2 has different effects in mice and rats. In a study on bovines, GH-receptor mRNA was only found in the pregnant uterus, not in the non-pregnant , while in an immunohistochemistry study on the non-pregnant rat the GH receptor was found in the uterus (e.g. in luminal and glandular epithelium, and vascular endothelium) . In sheep the GH receptor mRNA was found both in endometrium of cycling and pregnant animals . In a recent review the importance of GH as a modulator of female reproduction was discussed . It has been shown that exogenous GH with the addition of estrogen promotes proliferation and cellular growth of the rat uterus [32, 33]. There is a report where GH treatment without addition of estrogen also stimulates factors that affect growth of the uterus , but other studies disagree with this [11, 33]. Uterine ER mRNA and IGF-I mRNA levels were not affected by short time (24 hrs) GH treatment in ovariectomized rats, while E2 in the same regimen caused increased mRNA levels in both cases . The IGF-I mRNA level was highest in the TAM treated rats, but the levels in both E2 and TAM treated groups were increased as compared to OVX controls. The high IGF-I mRNA level could be one explanation for the increased risk of endometrial carcinoma found in women after TAM treatment. In TAM treated postmenopausal women the levels of IGF-I mRNA in the endometrium were shown to be as high as in type 1 endometrial carcinoma or in normal endometrium during the secretory and follicular phases of cycling women . The ERs (both α and β) were expressed in the uteri of the rats treated with ICI, the ERα mRNA level being similar to that of the OVX controls and the ERβ mRNA level showing a tendency of increase as compared to OVX controls. The result on ERα mRNA is in agreement with a previous study where the ER mRNA levels were shown to be similar in OVX controls and after ICI or TAM treatment . In contrast to this are the findings for the ER protein, where ICI suppressed the levels while TAM had no effect as compared to controls . A possible explanation could be the fact that ICI, unlike RAL and TAM, decreases the stability of the receptor protein . 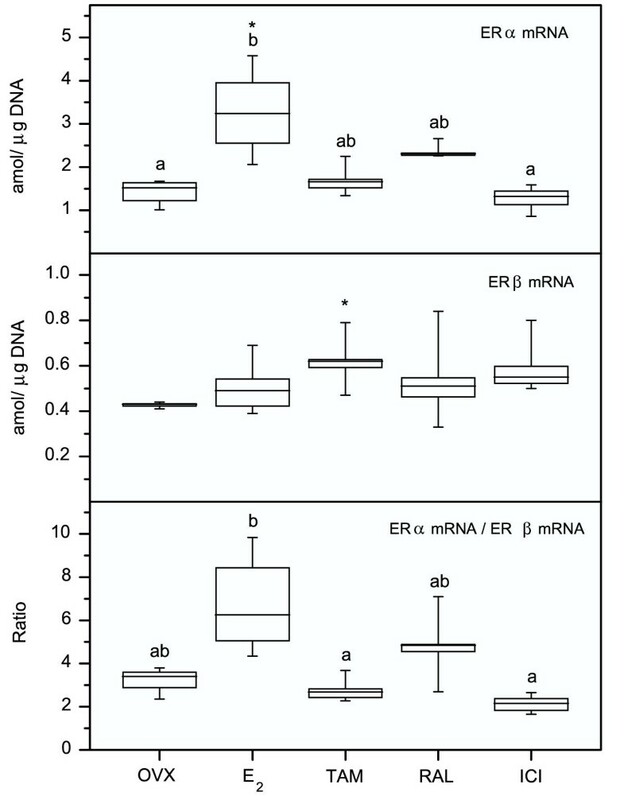 The ratio of ERα/ERβ on the mRNA level seemed to be decreased after TAM and ICI treatment, indicating a higher influence of ERβ. The ERα/ERβ ratio was lower in the TAM and ICI treated rats as compared to the E2 treated. Raloxifene showed an intermediate effect on the levels of ERα and ERβ mRNAs, as well as their ratio, that was not different from either OVX controls or E2 treated rats. Ki-67 is expressed in endometrium in all phases of the cell cycle except G0 . PCNA is found during proliferation most cell phases  and, as opposed to Ki-67, in DNA repair . The results of the immunostaining of proliferation markers PCNA and Ki-67 were similar. Proliferation in the uterine tissue was found to be more intense in the E2, TAM and RAL treated animals, as compared to the OVX controls and ICI treated rats. Estradiol and TAM treatment showed similar strong stimulation of LE height, with active proliferation in GE, LE as well as in the stroma. RAL treatment has been shown to give less negative side-effects on the uterus than TAM treatment , and this is in agreement with the low induction of increased LE height in the present study. Since the proliferation seems as high in uteri of RAL treated rats as in TAM treated in this study, the conclusion is that either the proliferation in itself is not the main cause for developing endometrial carcinoma, or the effects on rat tissue is different from that on the human. Another explanation could be that these markers are not always specific for cellular proliferation; an increase in their expression may reflect other cellular activities like DNA repair . The wet weight of the uteri showed a similar pattern as induction of LE height and the GH-receptor mRNA levels, implicating that GH is involved in the regulation of uterine weight. Tamoxifen, which has been related to increased incidence of endometrial carcinoma in women, dramatically increased the IGF-I mRNA levels in rat uterus. Thus, IGF-I could be a link to the increased risk of developing endometrial carcinoma, although no firm conclusion can be drawn between findings in rats and the outcome of TAM treatment in women. SERMs exhibited different effects on growth promoting factors and proliferation that were not obviously correlated to the estrogenicity and/or cancerogenicity attributed to the substance. We thank Monica Lindberg, Britt Masironi and Sonja Åkerberg for skilful technical assistance. The present study received financial support from the Swedish Research Council (grant 03972), the Swedish Institute (NM) and Karolinska Institutet. BE was a student at the postgraduate program in developmental biology and cellular signalling.